I don't know how AJR is going to feel about this... but I am completely infatuated with the idea of a country/rustic inspired (ugh, he hates the word rustic. sorry!) 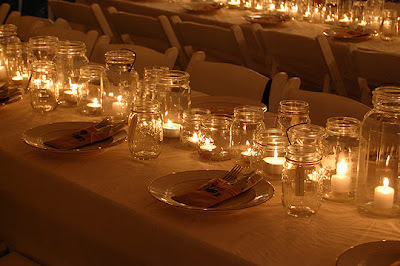 wedding reception. I'm not talking camouflage tuxedos or the bridal party doing kegstands (although I won't be surprised if some of our beloved friends decide kegstands are a good idea once the Grandmas leave). 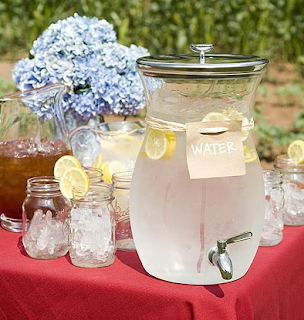 I'm thinking simple, sweet, homemade lemonade, outdoor reception, beer in mason jars, lawn games, good food, and just a warm and fun atmosphere. None of this uptight if-you-don't-dance-you-are-bored-at-your-assigned-table nonsense!